This is classic Ken Robinson who has insights to the education system around the world and is the cornerstone to radical reinvention of education in which art has the most to offer our children. Ken has proposed that art be located at the top of the pyramid in terms of subjects of importance. I couldn't agree more. I have become a changed person since first viewing Ken Robinson on TED talks. He has a clear and convincing argument how art is not fully utilised by educators and administrators and even politicians for the future of education. See more of Sir Ken Robinson for real insight to changing the education system. Big thanks goes out to all those who have worked on the collaboration. This is a video that was compiled by me and shot by the students. 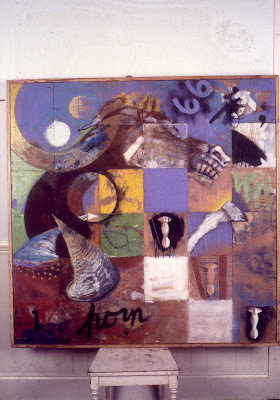 The origin of the work came froman inspirational piece of art by Nicholas Alquin. The drawings initially were a deconstruction from the woodcarving then later changed to the new language which is a dialog of drawing ..searching for meaning between shapes and objects which tell a story, that is the narrative. 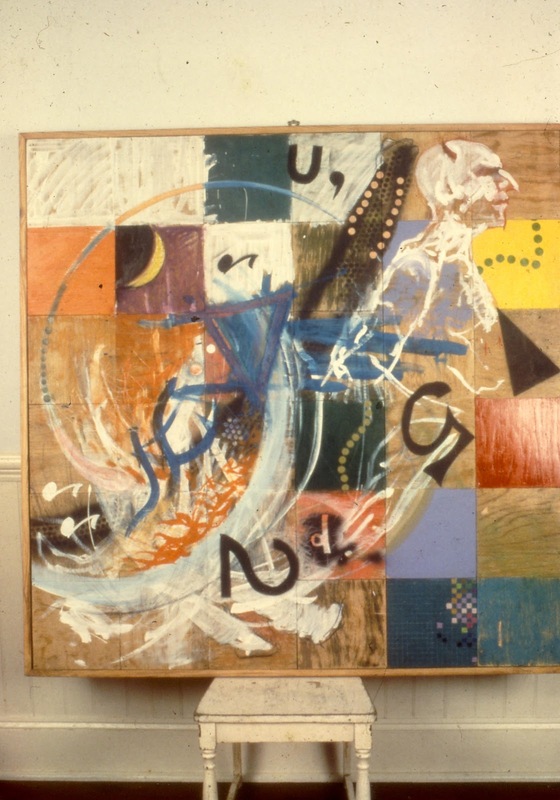 The Juggler is a work about balance and syncopation. 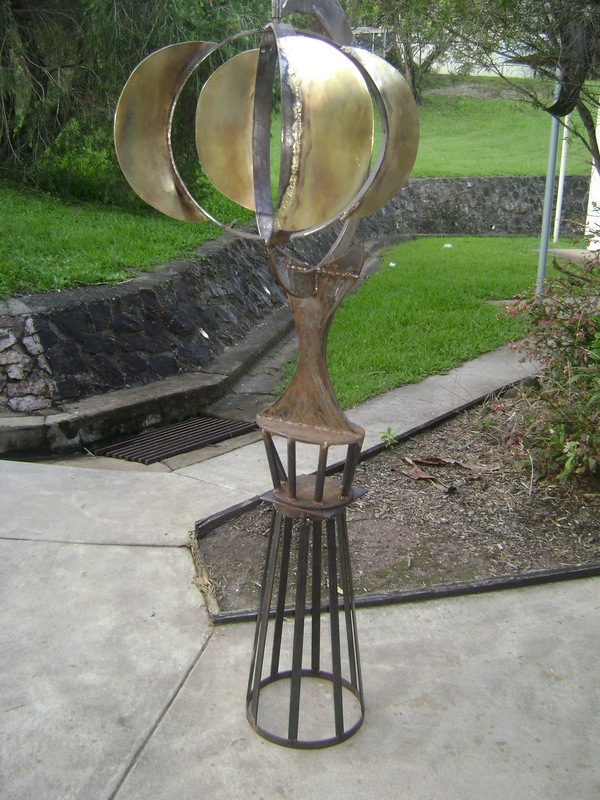 The whirligig component symbolises the sun and planets and is a talking point for the future of energy. The drawings are stepping stones to The Juggler and is permanently installed on the grounds of the school. and this space age thing really has caught my attention, it is a solar and wind machine that looks like a satellite. Get yourself involved and send me anything you think needs to be brought to the forefront. any ideas about where art and engineering may go? do you think young artists can generate a solution for the planets future energy needs? Or is it better to keep them separate? gotta keep em sep a rated. who sang that? This is Theo Jansen and he is amazing.. This is a complicated mind.of a genius. http://www.youtube.com/watch?v=CufN43By79s&feature=related this clip is a detail of Theo's mechanics. This is an amazing thing, I believe what he says of bridging the gap between art and engineering is the single most important key to finding the future of energy, and teaching this to students would be my dream...I am not an engineer but I sure would like to have a mind that could be so intricate. calculative..I guess? Today I am thinking about whirligigs and waterwheels...I want to produce a sculpture that turns spins empties fills and moves all powered by the wind sun water.....how can I do this? where do you start? now what is the main post? Is this thing having a central column? The outside could be a ring....like a horizontal pinwheel with many pinwheels moving in a circle? This is where things get a little strange. This is where things got a little strange...New Orleans in the jungle.voodoo brew. The ritual of the spirit. in between the beat of the jazz gig. I found the spirit, in a basement on independence street. the day died with a storm. Located in the Blue Ridge Mountains in North Carolina this is a magic setting for any artist to think about doing a residency. The atmosphere is serious and has a long standing tradition to the craft of art making. I have lived in NC and it is magic at Penland. Hello! Dolph Smith I miss your wit and knowledge....! 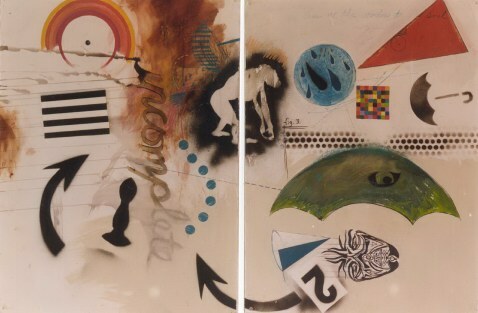 ......is a diptych on paper finished during the time spent in New Orleans in 1997-98 and was a time when the studio was in the Bywater of New Orleans. I rode my bicycle into the French Quarter were I worked for a sculptor named Joe Barth whose family business was building Mardi Gras floats. We worked on a grand project for the Eldorado Casino in Reno, Nevada. The weather was so hot we were working in a shed with temperatures well into the 100,s Fahrenheit. 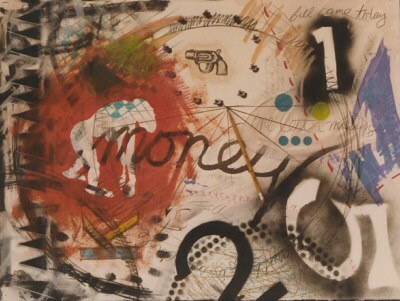 This work is part of a series that ended up in the Contemporary Arts Center with some Dutch Artists...what buzz early on in the Art career! The work was painted wooden floor tiles that measured 5' x 5'. The pallet changed from earthy Memphis colours, to Jazz influenced bright vivid colours typical of the New Orleans vibrancy. The time went too fast and I headed out of town in the very "boat like" car, my 1977 Pontiac Grand Prix. The Hurricane was always regarded as the one that is coming. I hope it is something of the same when I lived there. The great folk made the town what it was and I am sure that is still the case. You can view more from the archive by selecting archives. Going back a few years something from the archives...this was a show from Memphis in 94. This was drawing on the floor with rubber shavings from a tire re-tread business next door to the gallery, what a score! just improvised..and what a great effect ...this flat rich black colour. 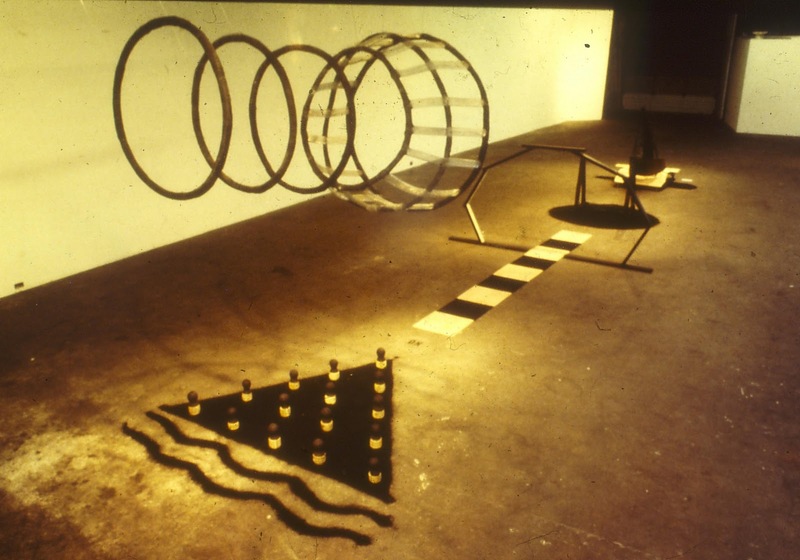 The hoops and obstacles are lined up in a rather "scenario" type setting where the whimsy of a steel and wooden object waits to be launched through, over , and under the mess(trials) that is life. 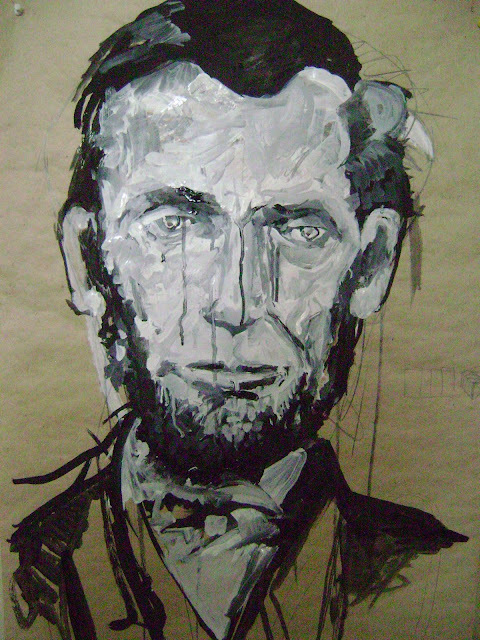 Added this rather distraught looking "bloody Abe" photo needs work along with the effort! I want to thank Nicholas Alquin for supporting the project we(students of Burnside High) recently completed. It was good to get an email from him saying he was inspired by us using his work as a reference. The Whirli-GIG Is this political? The idea of energy harnessing is the oldest tool sought for since man started salivating. (Don't quote me on that one, but it is important to note what is at the heart of the debate). What are we going to do when (now) the oil is running out....One dollar and 50 cents is here.. and what is it going to reach before we start getting serious about the crisis.???? I have the desire and the passion to teach this to our youth and the reason is this is not being discussed in the most important area of education ...the arts and the industrial design areas which are imperative for innovation and discovery. What can we do? Get them thinking about lateral thinking and more importantly why are we needing it? The youth have a fearlessness that is boundless. They yearn for new and inquisitive directions. The schooling that is being taught in a high percentage is just outcome based and a series of laws and systems that the "old" school have in place to make the (work) -their jobs easier. I say this is probably the real reason why the education system and most government systems are the way they are. 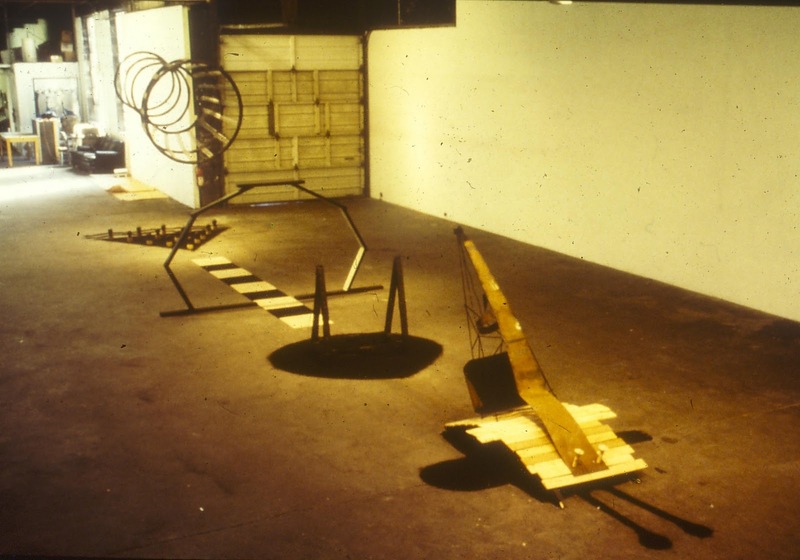 This is the whirligig before it was incorporated in the sculpture. Lets get the system turned around and give the students the tools they really need. Not to pass a certain test for the boys in the big office but the experiences of the environment...the natural environment.which has all our answers in living with nature. These solutions have been around for a while now and do not get the attention they need. By creating work that reflects these ideas I have a platform with which to change the minds of others. (wow did I just say that?) well that is the hope... and with children, given the real truth about our energy resource depletion, they can easily see that it is their solutions that will eventuate to real change. 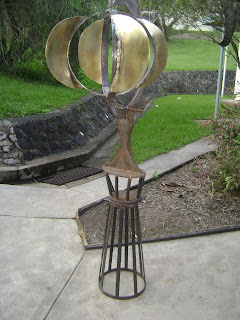 The whirligig is a speaking point as well as a functional spinning object that begins the topic for energy harnessing. It is important to start with the basics and from that comes innovation and invention. The same can be adapted for water and the next path I am looking at is waterwheels. I have written a few essays that are to be uploaded soon with videos to follow. Have you any comments post them on this site and discussion will begin.